• Fin tension screw allows adjustment to achieve lower end torque or top end speed to meet your preferences. The Hobie Mirage ST Turbo Fin Kit upgrades the Mirage Drive with new fins and masts to increase the surface area, and could give you gains in speed reported up to 10%. But its not all about speed, you can get top end speed and a slower cadence for cruising (Less pedals per mile). Hobie achieved this with this larger and a more efficient fin design. I have a 2018 Mirage 180 Oasis (tandem). I mistakenly ordered the incorrect Turbo fins ($137). So I sent them back and got the correct turbo fins that fit this mirage drive. I am HUGELY disappointed with the fins. They are much smaller than the older version. They are only 2" longer than the original fins and cost more! ($160). At my calculation, that's $40 / inch. I'm also not impressed with the additional speed (or drag) it provides. I know I paid premium for a Hobie Oasis but I feel totally ripped off by the Turbo Fins. Southwind was great in the return and buying the correct fins. Hobie totally let me down on this product. I have a 2012 Outback and boy do these make a difference. If you have the sail kit, this also helps keep your boat from slipping sideways as well. Easy to install. Took me about 15 min. A good performance increase over the stock fins. Measured 3-4 mph with the stock fins, 5-6 mph with these fins on the Outback. They do increase speed versus original standard fins. The turbo fins are a bit larger than the regular ones. They make a big difference on the water and I'm able to go a lot faster. It's a pretty cool upgrade if you ask me. These fins work really well. I just took my Hobie Outfitter tandem down to the sea of Cortez for a couple week of fishing and cruising around. I pedaled at least 9 miles everyday and I found that these fins really increase the speed of the kayak. The fins are a bit longer so you have to be careful about how much water you have underneath your kayak. The rods are pretty durable and I haven't bent one yet, but you should be careful anyways. If you go in shallow water a lot then I recommend using the shorter strokes so you don't beach yourself. Southwinds was very helpful, I didn't understand the installation, and they gave me some useful tips. 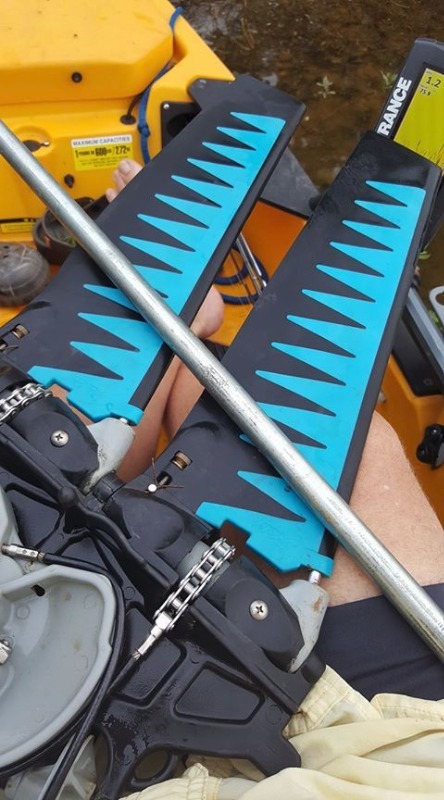 The fins are pretty easy to install, there is a Hobie video out there somewhere that explains everything. I also suggest adding the large rudder as it really helps with turning when you are cruising along with these fins.